Hvad er “fleur de sel”? Fleur de sel is a French sea salt. You can substitute flakes of another sea salt of your choice. I also like Maldon. To about improvisation! Looks wonderful. Simply divine! Those Christmassy flavors are heavenly. Can’t wait to make your delicious mistake! Beautiful dessert! The chocolate and orange flavors blend so well together. Can’t wait to try this. Sweet and salty desserts are so good and then you added Grand Marnier and that did it for me. I will definitely keep this post in mind in my next kitchen misfortune, I tend to give up easily and start all over, losing ingredients, time, and energy. Lynda, I love the ‘mistake’ chocolate and sea salt are a wonderful combination and the crunch would be incredible. I’ve seen this dessert but I have never made it myself; I would love to try your recipe. Why do mistakes never turn out this well in my kitchen? This is brilliant, a delicious twist on a classic pairing. Little mistakes make the best dishes! 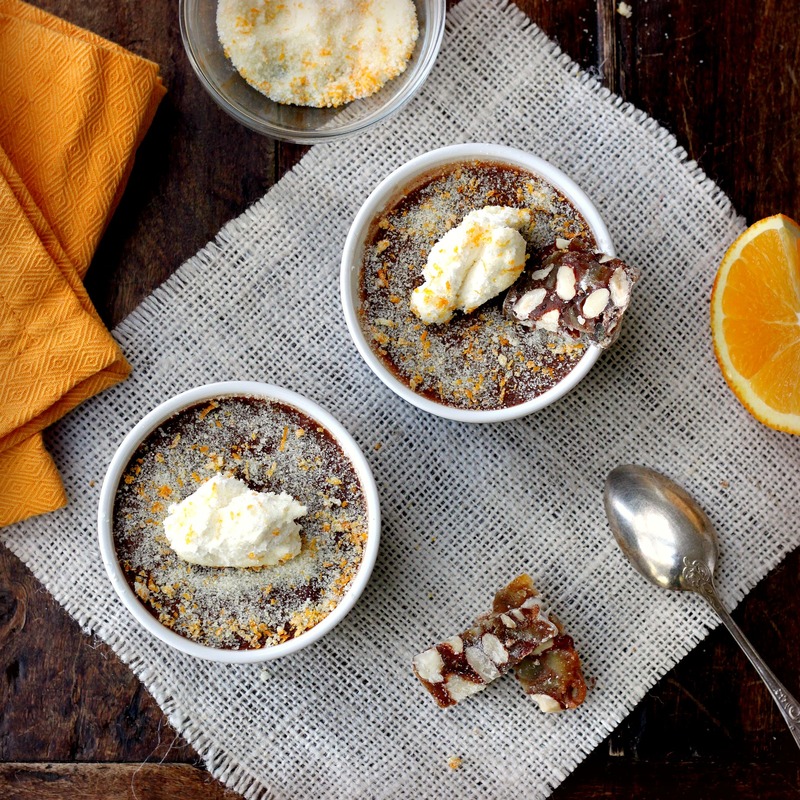 Love the fact that you used fleur de sel in this dessert, will try it next time! 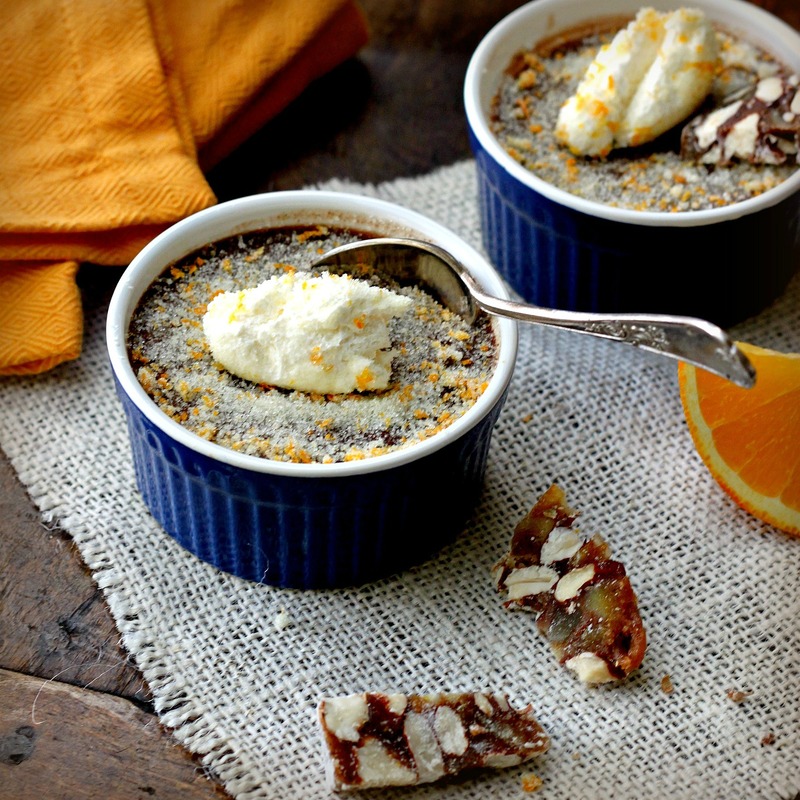 I just love pots de creme – such an elegant dessert! And happy accidents like this are the best. This looks like one happy accident! Sounds divine. What’s the brittle you have on the side? It’s an orange and almond paneforte. Oh! I couldn’t tell. That sounds like a lovely accompaniment. Is that your recipe as well? Thanks to y0ur Mom for introducing me to your blog! This recipe is absolutely delicious and makes a grand entrance. Will definitely make it again! The hint of salt on the first bite was very enticing and makes you want to eat more! Keep these “accidents” coming!